Solar towers use many mirrors to concentrate sun light on a central, tower-mounted receiver. The receiver then transfers the resulting heat to a fluid (i.e. 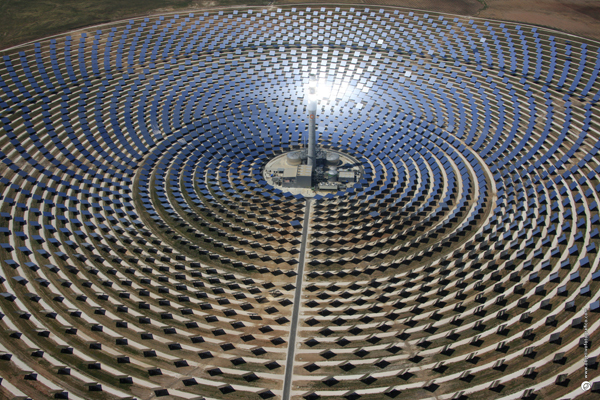 molten salt or air) that, in turn, exchanges the heat to steam which powers a turbine, generating electricity. The placement of the mirrors may lead to individual mirrors being blocked and shaded; this affects the efficiency (and therefore costs) of the power plant. The model is later used for an optimisation process which finds the most efficient arrangement of mirrors. Gemasolar plant, owned by Torresol Energy © Torresol Energy Investments, S.A.
A similiar problem is given by offshore wind parks, where an optimal placement of wind turbines is wanted, such that the turbines are not placed in the wind shadow of each other. To some extent, the above described models are implemented with a C++ code. Also an optimizer (genetic algorithm) was written, which optimizes the positions of the heliostats/offshore wind turbines. Within this practical course several problems are offered, each will be solved by a group of two to five students. Onshore Wind Farm Model Validate the simulation model against the free available code OpenWind using G-Tests. Heliostat Field Layout Optimization Multi-Step optimization of a heliostat field using a global optimizer and a local search as post-processing step. Accelerate the genetic algorithm with smart choices for the parameters. Implement the closest packing algorithm for initial solutions. Solar Tower Power Plant Model Implement canting and tracking methods for the control of the heliostats. Implement an annual simulation using different sun data techniques. Validate the simulation model against the free available codes SolTrace, tonatiuh and SolarPilot using G-Tests. Optimize the positioning of wind turbines in an offshore wind farm. Implement Tabu Search on a tilted rectangular grid and on a regular triangular grid. Apply a post-processing step (Local Search) and optimize the existing wind farms Horns Rev, DanTysk, and Sandbank which are all placed in the North Sea. For all topics basic skills in C++ is needed. Please state in which topic you are interested the most. If you already have a favorite partner, please indicate him/her, such that we could select you both during the registration process. This project is a corporation of the Theory of Hybrid Systems (i2) research group headed by Prof. Dr. Erika Ábrahám, and the research group for Continuous Optimization at IGPM. The project will be co-supervised by Pascal Richter. For further questions please contact Pascal Richter.